Many years ago I moved into a house with a small garden of about 45 ft. I needed an antenna system capable of the lower HF bands. The 1/2 size G5RV is a farce on the lower HF bands, as are most of the reduced dipole antenna arrangements so I wanted something that was a similar size but truly resonant so losses were kept to a minimum. This is the latest version of the arrangement I came up with. For years it became my standard quick and dirty install wherever I have moved. Several Radio Amateurs have built variations of this antenna and have reported excellent performance on 80m with good DX, especially in such a small space. Although at first glance this looks like a small "off centre fed" dipole, this is actually a nested Marconi 1/4 wave antenna on the lower HF bands, giving a low angle of radiation and predominantly vertical polarisation, and opposing feed impedance is used to provide automatic band switching without traps. The interaction of the nested elements means that both elements play their part 7MHz and up, with dimensions chosen to provide a good multi-band, low angle antenna. This latest version combines resonance of the horizontal top sections and the interaction between elements and on 10MHz utilises 1/4 wave feed technique similar to that used in the Zepp antenna, for improved multi-band performance. 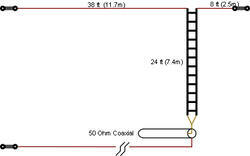 It is simple and very cheap to build, it is very effective in a small space and will beat a "1/2 size" anything by 10's of dB on 80m while taking up even less space. it is designed to look a bit like a short G5RV so that you can scrap your 1/2 G5RV to build it !! My own experiments over the years have shown that, on 80m, this antenna will perform close to a full sized dipole for DX contacts, despite the small size, because of the low angle of radiation (30 degrees) and full size elements. As this is a low angle antenna, NVIS (high angle) short skip contacts are only down by around 10dB compared to a dipole. This does not usually matter, unless the band is in poor shape, because NVIS signals are normally very strong. Remember that a 66ft Windom or 52ft 1/2 sized G5RV will probably not even work on 80m, and you cannot fit a full sized 80m dipole into a 46ft garden!!. When compared to "straight up" vertical antennas, the combined horizontal and vertical components of the G7FEK antenna still give rise to useful high angle radiation. Recently, on finding the original text document I created for my packet BBS in the early 90's, I decided to re-publish the design here. Throughout 2007 and 2008 the antenna was optimised using comparison signal reports. This was done at sunspot minimum proving the antenna is usable under poor conditions. As no two antenna modelling programs give the same results and it is not possible to model all parameters, computer modelling of antennas only allows for a proof of concept. Thus this antenna was optimised in the real world. I always advocate building antennas to evaluate actual performance, just as the professionals do. Few amateurs seem to want to build antennas these days, instead preferring to comment on their model data alone. I'm often reading antenna articles with "performance" data derived entirely from modelling software - often after significant number "tweaking". How can you provide performance data on an antenna which has not been built yet?. In response to your requests, I have included models sourced from other Amateurs. 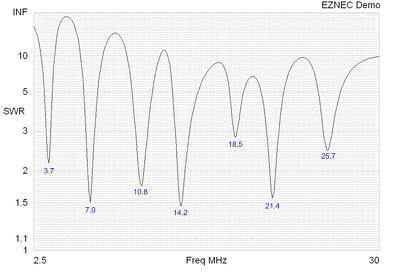 The EZNEC model shows less interaction than actually occurs in real life, but still gives a good idea as to how the antenna works. The MMANA-GAL model appears to be far more realistic when compared to the real antenna and is recommended for a more detailed assessment, plus the full software is free!.